The vast majority of my puzzles are paperfolding puzzles, that is puzzles which are solved (and often also set) by folding paper. Many of these can be found in my book Paperfolding Puzzles. My developments of the famous Flexatube puzzle are published in Silverflexagons and the Flexatube. Both these books can be purchased from the on-line shop on this site or from any good on-line retailer. However, as time permits, they will all be added to this page as well. The object of a transformation puzzle is to change one state of a puzzle into another. There is a sense in which every paperfolding puzzle is a transformation puzzle, but I usually reserve the term for apparatus puzzles where the possibility for such a transformation seems unlikely. Transformation puzzles can also be set up so that the aim is to find a route that avoids one particular intermediate state. In shape forming puzzles the object is to fold the paper to match the shape of a given flat shape or motif. In pattern forming puzzles the object is to fold a piece of irogami (paper which is white one side and coloured the other) to match a specified target pattern. The object of a layering puzzle is to fold a sheet of paper so that the corners, or other clearly identifiable parts, such as certain squares within a larger grid, lie on top of each other in a given order. A table-top puzzle is a folding puzzle where some part of one or other surface of the paper must remain in contact with the top of a table (or a similar hard surface) while each of the folds (or unfolds) that lead to a solution is being made. The challenge of a Fold and One Cut puzzle is to fold a sheet of paper in such a way that the target shape can be cut from the paper using just a single straight cut. 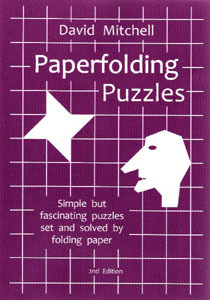 It is worth noting that, despite the name, Fold and Cut puzzles are pure origami puzzles. The solution is achieved just by folding the paper. The cut simply confirms that the solution has been found. The object of assembly puzzles is to find how to put pre-folded paper modules together to create a given form or pattern or combination of both.